I’ve been busy cooking this week, but I’m not really sure what to say about most of the meals that resulted. 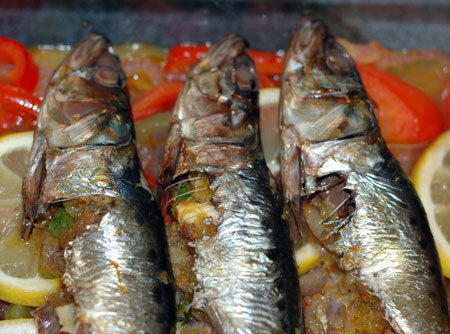 After the salt-baked snapper on Sunday, we had to quickly use our fresh sardines also, so I found a Mario Batali recipe that involved sardines stuffed with a bread crumb-almond-orange zest mixture and baked over lemon slices and a sweet and sour pepperonata. We also had a gigantic bone-in leg of lamb, which Jeremy wanted for braising. I went with the 7-hour lamb recipe that I’ve made once before, which allowed me to get the meal started at lunchtime (not the best idea in retrospect, since braises are pretty front-loaded operations, and I ran out of time). But since my cut of meat was the sort actually called for in the recipe, I used the method called for in the book: browining by broiling in the oven and braising in a large roasting pan. Unfortunately for me, our oven is really pitiful when it comes to broiling, so this part took at least twice as long as it should have, and I still didn’t get the color I was looking for. Then I realized that we had somehow run out of tomatoes, which is almost unthinkable; I substituted some tomato paste and my last 4 oil-packed sun-dried tomatoes, chopped up. We foil-wrapped the roasting pan as securely as we could and left, hoping that the braising liquid wouldn’t all steam off. 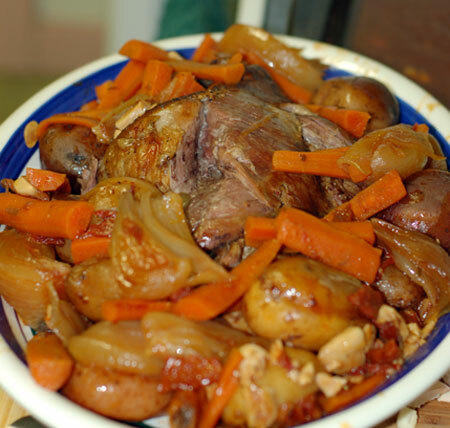 But we needn’t have worried about that, because in fact the lamb and vegetables produced so much extra liquid that it overflowed our rather shallow roasting pan and all over the bottom of the oven. Lovely. But the lamb tasted just as good as last time, even if it wasn’t quite as spoonable. On Thursday I made pork chops. The original plan was to have them with some porcini risotto, but I decided I wanted something a bit faster, so I made spaetzle instead, with a side of buttered peas. 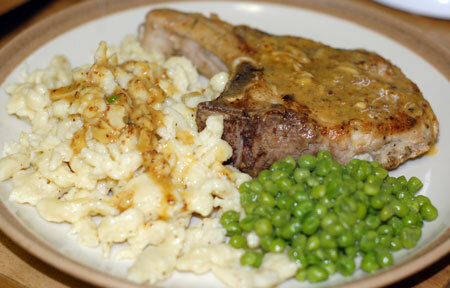 The pork chops were a Bruce Aidells recipe, and it made for juicy, flavorful chops even though I let their internal temps get a bit high while working on the spaetzle. Since it also calls for ingredients I typically have on hand, I think this is a method we’ll be using again, such as it is. And it meant I didn’t need to use my lamb jus-anointed oven. Trim the excess fat from the edge of the chops. In a bowl, combine the thyme, sage, salt, and pepper. Sprinkle the herb mixture on both sides of the chops. Let them sit at room temperature for 30 minutes; alternatively, cover and refrigerate for 24 hours. In a heavy skillet large enough to hold all the chops in one layer, over medium-high heat, heat the oil. When it is hot, brown the chops for 1 to 2 minutes on a side. Adjust the heat if the pan seems too hot. Lower the heat so the chops still sizzle. Cover the pan and cook for 3 to 4 minutes more or until a meat thermometer inserted into the thickest part registers 140 to 145 degrees. Transfer the chops to a warm platter (set the skillet aside), cover chops loosely with foil, and let them rest for 5 minutes. The internal temperature will rise to 145 to 150 degrees. Meanwhile, make the sauce: In a microwaveable container, combine the garlic and stock. Heat on the highest setting for 2 minutes or until the garlic is soft enough to mash. Pour off and reserve the stock. Mash the garlic with a fork. Discard all but 1 tablespoon of fat from the skillet, leaving the sediment behind. Return the skillet to medium-high heat. Add the wine and scrape the bottom of the pan. Reduce the wine by half. Stir in the stock, garlic, mustard, cream, and any juices on the bottom of the pork platter. Stir until smooth and thickened slightly. Taste for seasoning. Add more salt and pepper, if you like. Return the chops to the pan. Turn them several times in the sauce to reheat. Serve at once.